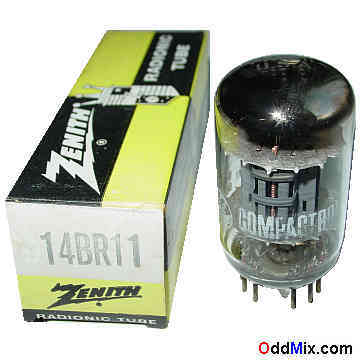 This is a genuine, original GE made (for Zenith Radio & TV Co.) 14BR11 Twin Triode, Sharp-Cutoff Pentode electronic vacuum tube. Developed for video, or audio and synch power amplifier, oscillator, but has many other uses. This three independent, tubes in one single envelope is great for spare or replacement part, antique radio and television restoration, ham projects, transmitters, circuit design and development or to set up a private vacuum tube museum. It is possible to build a Hi-Fi audio amplifier or an adjustable HV power supply with just this single vacuum tube. It is NOS compactron tube - New Old Stock, unused, boxed condition. First come first serve only one historical vacuum tube available!